Whenever I go to Pt. Defiance (and I go to Pt. Defiance a lot), I look to the left of the entrance and see a an old small building with a fence around it and I think of the beers I drank there back when it was called The Goldfish and how nice it was to have a good bar near one of my favorite places in Tacoma, but unfortunately like far too many other historic buildings in Tacoma, it has been left vacant for years. Enter Adam Dopps. Adam recently contacted me about his project, Defiant Goldfish. He and others are trying to reopen The Goldfish and return her to her former glory. He happily agreed to join me for 5 Question Friday and tell us more about it. 1. What is the Defiant Goldfish? The Defiant Goldfish stands for several things. It is the goldfish that refuses to die. It also stands for a bar and bistro that doesn’t conform to the norms. We are taking our 45 years+ in the restaurant and bar business, and adding the things we like the best about our top 20 places WE like to go, and creating a hybrid. When you are catering to the White Collar crowd, the Blue Collar crowd, the biker crowd, and now, Mom’s and Dad’s with their kids, you can’t do things the same way as Red Robin. The Defiant Goldfish is irreverent. We are respectful of all area’s of the business, but are not pigeon holing ourselves under any one category. 2. Why do you want to reopen this bar? This is a really good question. And the answer has changed quite a bit over the last couple of months. When we first started out, the focus was on finding a good location for a bar that would be happy spending the rest of our careers working in. We both are turning 50 very soon. I spent most of my 20’s and 30’s self employed, but have spent the last 16 years working for Corporate America. And it sucked! Corey and I are both a bit outside of the box. We are loud, boisterous, and spend most of our time laughing, usually at our own expense 🙂 My point of telling you this is; you can’t work in a corporate environment when you have out personalities, without having to temper who we really are. A couple of loudmouth guys that just LOVE to entertain and be around people. Since we started working on the inside of the building on Saturdays, we have had dozens of people stop in and talk to us about either their history in the Goldfish Tavern, or why they hope their is going to be a cool neighborhood bar in their future. Most of them want to talk about both. During the conversations, we have become a little nervous. Now, along with what WE envision for the new version of the Defiant Goldfish, we have come very aware of the responsibility it comes with. There are a LOT of people out there that are VERY attached to the tavern, and want it back very badly. At the same time we are renovating the building, we are quite aware that the elation out there about the fact that it is re-opening, is followed by the next strongest emotion about it; “Don’t screw up the Goldfish. We like it the way it was.” That last sentence keeps me up at night. The history and loyalty of the Goldfish Tavern and her patrons, as well as our Kickstarter Fundraiser Campaign, have turned this into a community project. That comes with high expectations, and meeting and exceeding high expectations is never as easy as it sounds, Those high expectations are what we are striving for. 3. What is the history of the Goldfish? The Goldfish Tavern has been in business since prohibition. 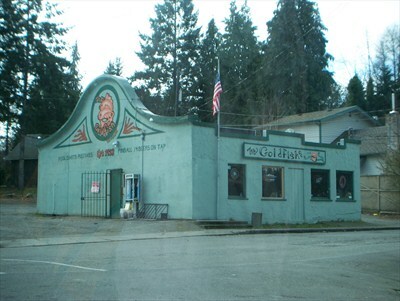 There are not many businesses that stay around that long, let alone a neighborhood tavern. It had stood the test of time until just two years ago when they closed down on Halloween Night. It was a gas station in it’s early day’s as well. It has had a lot of different owners over the years, trying different things or catering to different crowds. I hear “biker bar” a lot. I also here “neighborhood hole in the wall” a lot too. I have also heard “gay bar” and “punk rock bar” as well as “whistle stop” for the Ruston factory and waterfront workers that came there for a cold one after their shift was done. I have heard so many stories at this point that it is hard to decipher fact from fiction :). I had a gentleman send me a message a couple weeks ago asking if we were going to be “Harley Friendly”. I said “of course we are. We are also Suzuki friendly, Yamaha friendly, scooter friendly and car friendly. Trucks too :)”. This is where the history meets the road. There are a lot of folks that claim it as “their kind of bar” over the years, but I get the feeling that “definition” has also meant different things to different people since 1933. 4. How can people help make the Defiant Goldfish a reality? Getting the Goldfish Tavern back up and running as the Defiant Goldfish is not easy. It is also very expensive. One of our main changes to the building is that we are adding a full kitchen, which is the most costly thing you can do in a building. That requires new plumbing, new electrical, new permitting, new higher licensing cost’s, new equipment, and the relocation of several parts of the old layout, to make room for the kitchen. Bringing a building that has been there since 1933 up to today’s code is a project. To help cover these cost’s, since neither Corey or myself are rich, and did not show up to this party with any deep pocket investors, we have launched a Kickstarter Fundraising Campaign. This is a way for people to become involved in the project and contribute to it’s success. People can pledge as little as $10. If we meet our goal of $22,000, then their credit or debit card will be charged the amount they backed us with, when the campaign ends on December 5th. I we do not reach our goal, they are charged nothing, but we also don’t get a dime, making this project die. They can also like our facebook page, and share our story on their own Facebook or Twitter page. That is crucial to our success. – You give money through the Kickstarter website, using your credit ot debit card. – Kickstarter takes a small cut for their expenses (so does Amazon Payments). – You get recognized as a contributor, and receive a reward proportionate to your contribution. I could not explain it better myself. It is easiest to understand by going to the website and seeing for yourself what it is all about, what you can contribute, and what you get in return for your contribution. 5. What do you see for the future of the Defiant Goldfish? I see me retiring in about 20 years and looking back on how much the new incarnation of the Goldfish has affected people’s lives. How many people have met there over the years and become lifelong friends. How many people have met there future spouse there ( I met my wife in the first bar I owned, and we have been together for nearly 20 years). I see us providing a place to the people of N. Tacoma where they can go and meet up with friends for a great meal and fantastic beverage. A place where mom and dad can go with their kids to build their own memories. I see this place, in 2033, having one hell of a party.